Dutch artist Carolein Smit produces figurative sculptures of melancholy beauty which evoke feelings of attraction and repulsion. While often taking animals as their subject, her works frequently explore themes of humanity, innocence and vulnerability, and are often of quasi-religious character. The poignant Rakker met gouden tranen (Rascal with golden tears) suggests ideas of guilt and redemption. Earthenware figure of a sitting black and white dog, with lowered head. 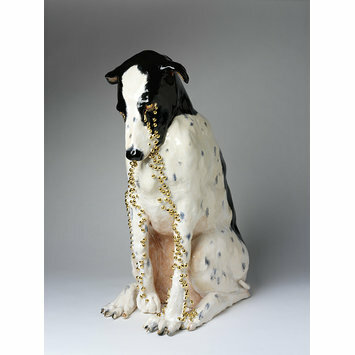 Tears in the form of beads painted with gold lustre descend from the dogs eyes down his front. Shown by Flatland Gallery at the art fair Collect 2010, Saatchi Gallery, London. 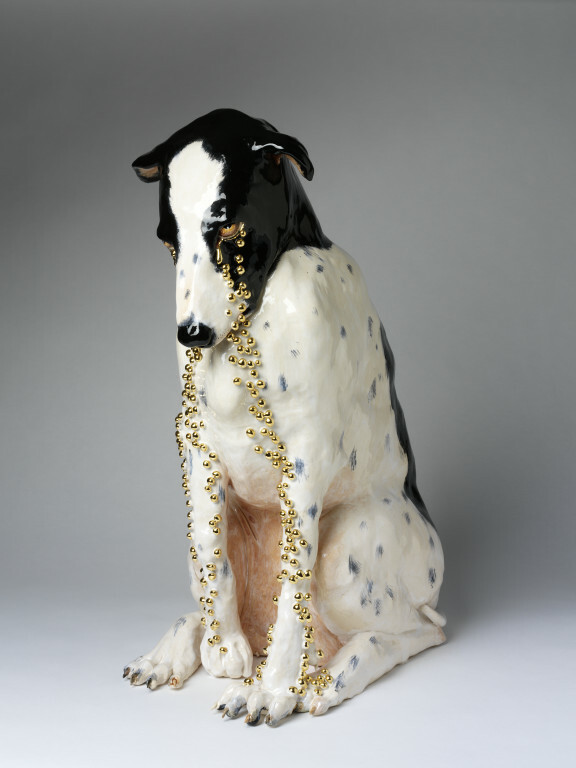 Figure, earthenware with coloured glazes, 'Rakker mit gouden trannen' (Rascal with golden tears), Carolein Smit, Netherlands, 2009.